The rules of women's lacrosse differ significantly from men's lacrosse and are specifically designed to allow less physical contact between players. As a result of the lack of contact, the only protective equipment required is eyewear and a mouthguard. Although these are the only protective equipment, there are still many injuries due to accidental checks to the head. The pockets of women's sticks are shallower than those of the men, making the ball harder to catch and more difficult to shoot at high speed. Women play with three attackers (or "homes"), five midfielders (or "middies"), three defenders (starting from the back, called "point", "cover point", and "third man"), and one goalie. Seven players play attack at one time and seven defenders are present. There is a restraining line that keeps the other four players (plus the goalie) from going into the attack. If those players cross the line, they are considered offsides and a penalty is given. In women's lacrosse, checking is much different than in men's. One way it is different is that women may only check if the check is directed away from the ball carrier's head. Also, women may only check using the side of their stick. If caught by one of the referees using a the flat of the head, it will be called as a "held check" and the opposing team will get the ball. There are two types of fouls in woman's lacrosse, major and minor. When a minor foul is committed anywhere on the field, the player who fouled is set four meters to whichever side she was guarding the person she obstructed. If a major foul occurs outside of the 12 meter fan or eight meter arc, the fouler must stand four meters behind the player she fouled. There are two different surroundings around the goal on both sides of the field. The eight meter arc and the 12 meter fan. When committing a major foul inside either of these areas, all players that were previously inside the surrounding must take the most direct route out. The player who was fouled now moves to the nearest hash mark that is located around the edges of the arc or fan and either takes position to shoot or to pass (although, most often to shoot). When the whistle is blown, the player with the ball may move up and try for a goal. The most important rule in women's lacrosse is shooting space, this is a violation of the rules. It occurs when a defender moves in at a bad angle on the offender while shooting in the 8 meter arc. This is a dangerous play made by the defender. Women's games are played in two 25-minute halves. These 25 minutes are running time, except for the last two minutes, during which time stops when the whistle is blown (This can differ when playing high or middle school games). While the whistle is blown, players are not allowed to move. In women's lacrosse, players are not allowed to touch the ball with their body or cover the ball with their stick in order to scoop it into their stick or protect the ball from picked up by an opponent. The women's lacrosse game has been modified significantly over the past ten years. Modifications include limiting the amount of players allowed between the two restraining lines on the draw to five players per team. Stick modifications have lead to offset heads, which allow the women's game to move faster and makes stick moves and tricks easier. In 2002, goggles became mandatory equipment in the United States (but not a requirement in international rules). In 2006, hard boundaries were adopted. The yellow card is for a first-time penalty and results in the player being removed from the field for five minutes (three minutes in high school competition). There are 11 field players plus a goalie for each team.The lines on either side of the centerline are called restraining lines. Only seven field players from each team are allowed into the offensive side of their restraining line. This prevents congestion in front of the goal. First, second, and thirdhome, also known as “line attack”, have roles that are primarily offensive; shooting on goal and feeding cutters. They will typically stay behind their opponents restraining line. 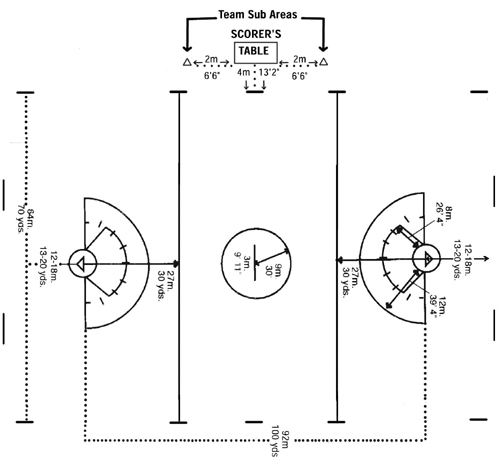 The attack wings, center, and defense wings, also known as midfielders, are counted on to play equal parts offense and defense and they run the length of the field. The point, cover point and thirdman, also called line defense, are defensive specialists. They tend to stay behind the restraining line when the ball is on offense. Out of deference to the games heritage as a Native American war game, there are no uniform boundaries in girls’ lacrosse. The ball is awarded to the player closest to the ball when it goes out of the playing area. That is why you see players running hard after the ball as it’s going out of the playing area until they hear the whistle. There are two types of fouls: Major and Minor. Major fouls usually pertain to offenses that are potentially dangerous. Players may not use their sticks recklessly or impede the progress of an opponent. Attackers may not hold or cradle the ball directly in front of her face. Players may not push, trip or back into an opponent with their bodies or set illegal picks.Some major fouls occur only within the 8-meter arc. A defender cannot play zone within this arc for more than 3 seconds; they must mark up and get within an extended stick’s length of an offensive player. Likewise a defensive player cannot be within the shooting space of an attacker, (defined as the cone between a ball handler in the act of shooting and the goal), unless they are within a stick’s length of the attacker.Minor fouls are things like checking an empty stick, covering a ground ball with a stick, (raking), or guarding the ball with ones feet. Players may not ward off with a free arm or play the ball with their hand or body. A minor foul by the defense that occurs within the 12-meter fan results in an indirect free position, which means the player with the ball must pass the ball before a shot can be taken on goal. The player who committed the foul is moved 4 meters away behind the player with the ball. 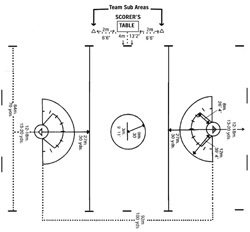 A minor foul occurring with in the 8-meter arc also results in an indirect free position but the defensive player committing the foul is placed on the 8 meter arc directly in front of the player with the ball who is positioned on the 12 meter fan.When type of foul is committed outside of the arc or fan, (the critical shooting area), change of possession is awarded and the player committing the foul must stand 4 meters behind the player with the ball.